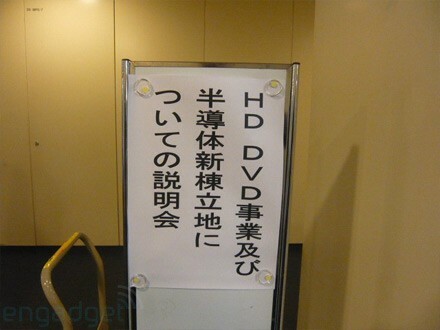 Engadget Japan is live at Toshiba's HD DVD press conference in Tokyo right now. It's nearing 5PM, when the bell is expected to toll for HD DVD, and we can all move on with our new lives as Blu-ray (or download) buying consumers. It won't be in the usual second-by-second coverage, but we'll do our best to have live updates as they come in, so check back to this post. IT'S OVER! The release just hit the wires even before Toshiba started talking. "Toshiba Announces Discontinuation of HD DVD Businesses." 5:00PM - Right on time, Toshiba's president, Nishida-san, takes the podium. He is talking about how great and advanced HD DVD was. WAS. He is also speaking about how Toshiba shared a good partnership with Warner. "There was a difficult decision. Multiple standards have a huge impact on consumers." 5:15 - Now he's just reading from the release, more or less. They're on to bigger and better things: two new NAND factories in Japan, one will be jointly-operated with SanDisk. Three part Q: what was the cause of HD DVD's failure? What is Toshiba doing with its Aomori HD DVD factory? And what about the timing of the announcement? A: From an objective, fair point of view, we were clearly in a good place until last December and January. So we were very, very surprised by Warner's announcement. As for the Aomori factory, nothing is final at this moment. Q: Any plans to adopt Blu-ray? A: No plans at all, not at this moment. Q: Are there no plans for next gen optical disc at all? A: We don't have any plans to announce at this time. Q: Is there any risk of a class action lawsuit against Toshiba for the format war? A: [For early adopters] there will be always be a risk in buying, that is how it works in the US. We are just hardware maker, so our legal risk is relatively low, we believe. Q: What is the next-gen NAND flash memory you'll be producing? What does that mean, exactly? A: 3D NAND is a possible candidate, but just one of them. To avoid any confusion, we cannot say which next-gen memory technology Toshiba will choose to pursue. Nothing is final. Nishida-san's now answering why the construction will take such long time on the new factory, explaining about how its construction will make it virtually earthquake-proof. Q: How about the process size of new factory? Is that 32nm? Q: How many HD DVD players and recorders, exactly, did you sell? A: 600,000 players in the US and 300,000 Xbox 360 HD DVD drives. 100,000 units were sold in Europe. And about 10,000 players and 20,000 recorders in Japan. So about 1,030,000 units worldwide. With regard to future media availability, should disc companies will cease production (oh they will!) Toshiba will buy enough discs for current Japanese HD DVD recorder users and resell them online. Now Nishida is talking about how upconverted DVD still looks great.